A message from the HAPS Western Regional Director, John Jackson. It’s in the books. It’s finito. It’s all done. The 31st Annual HAPS conference over. If this conference was a carnival, it would be shutting down the rides, closing the booths, and pulling up the tent-stakes. Next stop: Columbus, Ohio in 2018. We’re bleary and weary on this last morning, and saddened already from having said (and having still to say) so many goodbyes. It’s not easy – now or ever. But we will meet again – and I’m already looking forward to next year. Having had the pleasure of teaching with the 2018 Conference Coordinators Melissa Quinn and Jennifer Burgoon this past year, I know they have some amazing things in store for us in Columbus. Saying goodbye to them is really more about anticipating the upcoming conference, and all that’s in store there. As you know, every HAPS meeting is really two meetings in one. This doubles the number of goodbyes. The update seminars at the conference location headquarters re-introduce us to our dear friends among the exhibitors –those vendors and publishers, big and small– whose support and presence make the HAPS Annual Conference possible. The vendors are with us for two days, and then we have to say the first set of goodbyes. Then during and after our educational workshops, more HAPSters come and slip away quietly, until those who stick it out until the very end have this strange mixture of separation anxiety and survivor’s guilt at being on the last bus back to the hotel. Bill Perrotti is among those who gets hit hard by the goodbyes. It’s as though he’s a camp counselor who can’t let his charges go at the end of the week. When it’s time to say goodbye, Bill seems to forget the excitement and energy he has shown at each and every first timer’s breakfast since 2002 (the Paleozoic era of HAPS conferences). He embodies the welcoming spirit of HAPS. He is quick to remind everyone of the enduring friendships and academic collaborations in his life due to his involvement in HAPS. Perhaps he forgets all of that good stuff when it’s time to say goodbye (perhaps it’s his age). But it’s always hard to say goodbye to Bill. A quick shout-out to Sally Jo Detloff, who reminded me in the elevator that “we’re only an email away.” She’s right, of course. By recognizing others, reaching out, and thanking our colleagues, we can avoid the goodbyes that make HAPS Conferences so bittersweet…to the point that we’re not really saying goodbye at all. Instead, we’re keeping the warm “hello” that begins each HAPS meeting moving and working through our academic lives until our next meeting. Happy trails –until we meet again! 2018- We’ll see you in Columbus! Becca Ludwig is an experienced HAPS blogger and brought us a series of five posts in March 2015 from the A&P student perspective. Now we get to hear from her again, this time as successful graduate! A message from Occupational Therapist, Becca Ludwig. I joined HAPS because my close mentor and A&P instructor encouraged me to attend the annual conference in Jacksonville Florida in 2014. I was eager to jump at the chance. Through many conversations with this particular professor, she saw that I had a desire to one day follow in her footsteps and teach A&P. She was the first person who told me that I could teach. It was not until then that I thought of being a professor as a career choice. When I first attended the annual conference in 2014, I was pleasantly surprised to find that there was a strong network to support every member, including me. I was only a grad student at the time and just diving into my love for A&P and teaching. I did not think that there was much that I could offer. It was at this conference that I really started to seriously consider the possibility of becoming a professor. Everywhere I turned, I met or found new resources that could help me reach my goal. There were amazing speakers, insightful and supportive colleagues, and interesting poster presentations. After the conference, I joined the Communication Committee and have enjoyed reading and writing blogs, finding the Friday funny for Facebook, reading into the histology challenge, and keeping up with the latest HAPS news. I was integrated into the HAPS community and welcomed with open arms. This unique network has connected me to so many people and opportunities and I am grateful to be taking advantage of this support. I can come to the annual conference and listen to perspectives and learn about potential routes to reach my ultimate goal of teaching. It does not matter if someone is a first year professor or a veteran…everyone is open to learning new things and sharing their experiences. This is what makes HAPS great! A message from the HAPS Executive Director, Peter English. 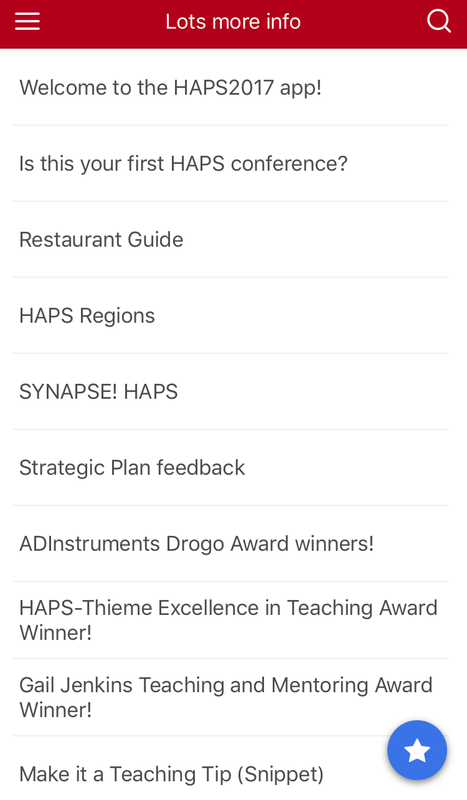 Last year we had a post detailing all the features in the 2016 conference app, as well as some video tutorials. Most of that post is still correct for the 2017 app (so take a look here), but every year we add some cool new features. Instead of focusing on the absolute TON of information contained in the app, we’re going to focus on the new things. This is the activity feed as it will be projected on the wall. Good reason to add a photo to your profile! You will still open the app to the ACTIVITY FEED. This year you have the option of having your posts to our private feed also cross-post to other social media like Facebook and Twitter (only your posts – each person controls his/her content). You’ll also get points for posting, liking, being liked, etc on the feed. Last year people earned points, but they were kind of pointless points because no one could see them. 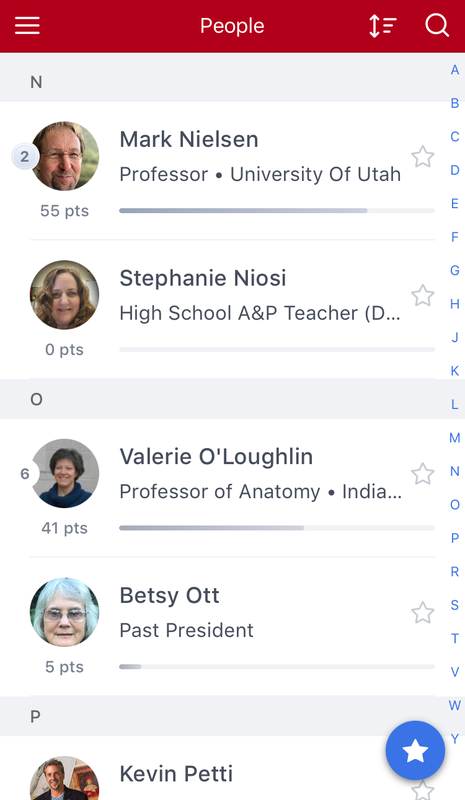 This year you can see them on the leaderboard in the PEOPLE tab, which includes everyone who creates a profile in the app. Don’t forget that those profiles allow people to look you up after the conference and keep in touch, so it is worth putting some contact info there. Lots of HAPSters are already earning points! This year we have added cool twist to the ACTIVITY FEED: We are going to project feed on a big screen where everyone can see it. We’re thinking that will be in the coffee and snack area, but that could change if we find a better place for it. It should be fun to watch the posts rolling in without having to hunch over a small screen. Of course the SCHEDULE and PRESENTERS are all in the app – and from the schedule you can RATE the sessions and give feedback about what you liked best. Since we can edit the session information in real time, the schedule will be correct in the app even if the change only happened 20 minutes before. As with last year, we will also list changes in the NEWS & UPDATES section. Last year we found out how incredibly useful the GPS MAP can be in navigating around the University campus. This year workshops will take place in five separate buildings at the University of Utah – all of those buildings are in the GPS map so getting from one to the other is going to be pretty simple. The hotel and convention center are also in there also in case you feel like walking back at the end of the day without getting lost. The LOTS MORE INFO tab is bursting with information! This year the MAPS & FLOORPLANS section includes an extra layer of information. Tap on the map and the parts of the map that concern HAPS events will light up. Tap on one of the regions, for example a room in the convention center, and all of the events in that location will be listed. Looking for the first-timer’s breakfast? This is the easy way to get there. So download the app today and see what it can do for you. 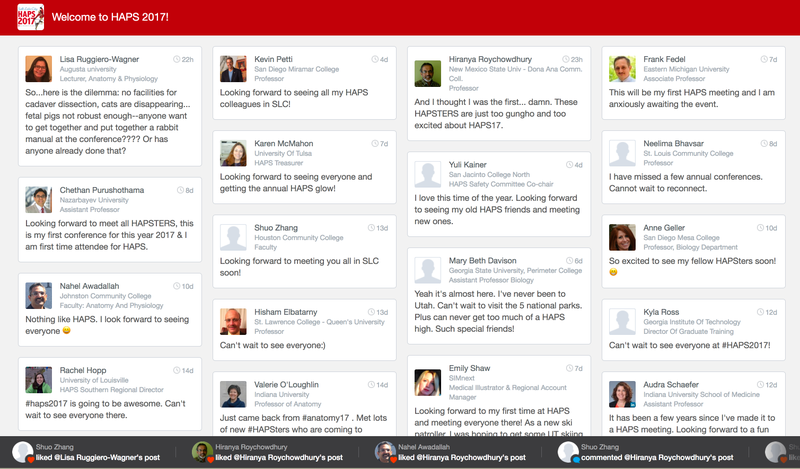 The conversation on the Activity Feed is already going, about 75 people have already set up their profiles, and there is lots to see (the LOTS MORE INFO tab now has 18 subsections!). We hope that you enjoy using it and that it makes a wonderful conference just a little bit nicer. No smartphone? No problem. Most of the features are retained in the the app’s website. A message from Polly Husmann, Ph.D., an Assistant Professor of Anatomy & Cell Biology at the Indiana University School of Medicine where she teaches anatomy to medical, graduate, and undergraduate students. As the final blog post on poetry in anatomy, this week’s poems focus on the experience of anatomy lab. We all know that anatomy labs, especially those that involve cadaveric materials, can be difficult for some students. Our labs do include prosected male and female donors as you will read about below. The following students chose to reflect (quite eloquently!) on their experiences dealing with our donors and the amount of work that Anatomy A215 requires of them. I always notice his Ears. Are easy to feel distance from. Until I spot his Ears. But what to expect for anatomy, I didn’t know. Made me wonder which section we would start on today. And my sternocleidomastoid moved my head to that sound. My heart skipped a beat as my anxiety rose. I walked up tentatively to show my respect for the girl. There was the brain plain and open. The brain that once contained memories. That was right in front of me. Who felt love, happiness and pain. And maybe they were a rebel who never did what they were told. That held such intangible things in their day. I’ll hope someone in anatomy can appreciate how incredible our bodies are made. As a continuation of last week’s blog on poetry in anatomy, this week’s poems focus on different body systems. Many students wrote their poems about different systems or structures of the body. For whatever reason the digestive system seemed to be the most popular (disclaimer: they were asked to keep it professional). And a relaxed urinary sphincter lets you…. pee. That controls how I speak. That stores the auditory memories that I wish to seek. That stores taste memories so I can remember my favorite foods. That controls how my body moves. That receives senses from my skin, muscles and joints. That interprets visual images in which my eye points. Capillary to venule to vein. Through the Vena Cava I drain. The contraction fills me with joy. I am almost ready to deploy. Left atrium to ventricle with ease. Finally, into the aorta I squeeze. I am indeed, the tissue, blood. November 30th, woke up around 11 a.m. But would you seriously want someone to eat ya? Now that I’m gone, I hope I’m finally famous. I hope you all enjoy the poems- check back next week for poems about the anatomy lab experience! Inspired by the works of Allan Wolf (2003) and the HAPS annual meeting Synapse presentation of Judi Nath (2016), I wanted to encourage more creativity, and especially poetry, in anatomy. Thus, in the Fall of 2016, I decided to give an extra credit assignment to my undergraduate anatomy students. Anatomy A215: Basic Human Anatomy is a large (400+) undergraduate anatomy class most commonly taken by students that are interested in allied healthcare. Many of these students have never taken an anatomy class before and may not feel that science is truly their forte’. The course includes three fifty-minute lectures and two two-hour labs per week for a total of five credit hours. The course has a total of eight hundred points available and is assessed using four multiple choice examinations for lecture and four examinations with short-answer identification questions for lab. There are also ten online quizzes, also in multiple choice or matching format. As such, there is very little room for more creative thought processes. In addition, twenty points of extra credit are offered each semester. Sixteen of these are given based on online practice assignments (also multiple choice or matching) that deal with each chapter of the book. The remaining four extra credit points are then left at the instructor’s discretion. For two of the discretionary extra credit points, I assigned my students to write a poem. For the content of the poem, the students were given two options: 1) their favorite anatomical structure or region or 2) a reflective poem on their experience in anatomy. The poem had to be an original work and was required to be at least eight lines in length. Rhyming scheme (including presence or absence) was completely up to the student. They were given ten days to complete the assignment (including the Thanksgiving break) and could turn in via either an e-mail or a hard copy of their poem prior to class. Ultimately, 207 students turned in a poem. The following poems are examples of the submissions for this assignment and, I believe, demonstrate the enthusiasm that some students show when given the opportunity to express their creativity (even when only a few points are offered in return!). Next week we’ll share more! Its purpose is to line. It is simple or stratified. It often contains projections that are very fine. Or it might even be keratinized. Or it can block like a barrier and part ‘em. The numerous roles of epithelium. Do you have a teaching tip you’d like to share? You can do it here. Nath, Judi. 2016. “More Than You Bargained For: RAAS and the Transcending Role of ACE Inhibitors.” In Annual Meeting of the Human Anatomy and Physiology Society. Atlanta, Georgia. Wolf, Allan. 2003. The Blood-Hungry Spleen and Other Poems About Our Parts (Candlewick Press: Cambridge, Massachusetts). Spelling: Why is this so hard?! A message from Nichole Warwick, Clatsop Community College Biology instructor and member of the HAPS Communications Committee. It’s always amazing to read the list serve posts that arrive in my email box throughout a term- and there seems to be a cycle to them. School starts, we talk about spelling and retention; the end of the term, and we share the interesting things students write on final exams. September was no different, as peers across the nation shared their emphasis on spelling vs student missing the concept correctly. Some posts suggested it was a lazy student that did not value spelling as a skill. I routinely point out in my class that if a doctor calls for test on the ilium, you want to make sure it isn’t the ileum. This inevitably seems to get some snickers. But this conversation brought me back to when I was a student and the life long struggle I have had with letters. To this day I misspell things, not because I don’t value it and trust me, it’s flat out embarrassing to ask your students if it “looks” right, but because my brain struggles with letters. Add a panic moment (much like a student on a lab practical) and all of a sudden I have vowels swirling in my head, almost jumping out of my brain at my eyes and spelling just gets difficult. I have moments where e and i, i and e seem to be revolving in my mind and I can’t pick which one comes first and which one comes second. As we master our discipline and become experts in the field, the absurdity of misspelling a word becomes evident. We talk about sloppiness and if a student values spelling. But if we recall what it is like to be a student, to be learning what may amount to the equivalent of a foreign language that is medicine, toss in greek and latin roots, the fact that the study of English from childhood is not very similar to the study of Spanish in which conversations occur on the roots of words, and we are not just teaching the human body; we are teaching language. How many of us have attended a Ken Saladin’s language talk at a HAPS Annual Conference and discovered issues in our own pronunciations? In some cases, the student may be so overwhelmed with what they have to learn, that they prioritize spelling at the end (unless it means points). My class spends time on what a spelling error may be, versus a conceptual error. I hold them accountable for spelling and it equates to points missed. They are told they cannot use “fibia” or “tibula” and get credit because this shows a concept error vs a spelling error, and as I continue to wage my own personal battle with spelling, I support them in theirs and recognize that spelling for the novice student may be a bit more complicated than laziness.